As you all know- my daughter has been a little bit of a terror lately. I know, I know she's two but it's still not fun to have to drop your kid off at preschool looking like your neck was attacked by a tiger because you forgot Gymbo the Clown in the car. Yep- we've got a scratcher. When I tell people this they say, "better than a biter" but honestly I don't find either appealing. I have started using in the corner time outs but I don't know if they are working or not. I guess it's too soon to tell. 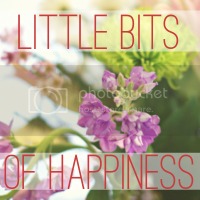 Oh yeah- the title of this post is "Little Bits of Happiness", don't worry I'm getting to that. The bad behavior has made all the good moments that much sweeter. The cuddles, the hugs and the "I love you-s" are always nice but they are especially nice now. Yesterday afternoon my little devil was actually being a good girl. We were playing in the playroom but I also had the television on in the background. The Fresh Beat Band came on and while Aubs doesn't usually watch that show, she does enjoy the opening credits. She especially loves when they say "Shout" for some reason. She was laughing so hard every time I yelled "shout" that I had no other choice but to capture it on video and share it with all of you. These giggles are all the little bits of happiness I need to get me through the tough times. I SO wish there was an extra day in the week to get things done. Your daughter is so cute! And my step-daughter is a scratcher lately as well, it's so tough to deal with because there isn't a clearly defined way to discipline them or work with the problem! Good luck, I'm sure she'll grow out of it. Oh wow, this is CUTE! And Lola has that shirt, too!